David Thorne is an Australian humourist, satirist, and Internet personality. His work has been featured on the BBC, the Late Show with David Letterman, The Ellen DeGeneres Show, and Late Night with Conan O'Brien. Thorne gained public recognition in late 2008 for an email exchange in which he attempts to pay an overdue bill with a drawing of a seven-legged spider. The exchange spread virally via email and social networking sites, leading to a surge of visitors to his website 27b/6 (27bslash6). 27b/6 features a collection of humorous emails and articles from Thorne's life. 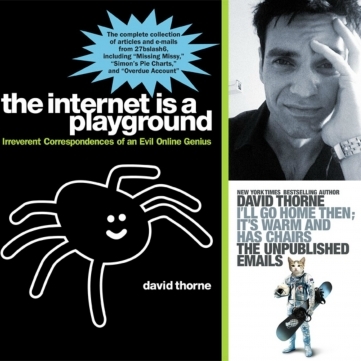 These and additional essays appear in Thorne's book, The Internet is a Playground. Published by Penguin Group and released on 28 April 2011, the book debuted at number four on The New York Times Best Seller list. BOLOGNA Book Fair: EDIZIONI EL is one of the 5 nominees for Best Publisher for Boys in Europe! Congratulations! We are SO thrilled to announce that ARGO won the Academy Award for Best Picture last night at the Oscars awards ceremony! The film also took home two other Oscars for Best Adapted Screenplay (Chris Terrio) and Best Film Editing (William Goldenberg). We sold rights to Partvonal in Hungary. ANNOUNCEMENT: We are more than pleased to announce we represent from nowon the HEAD OF ZEUS publishing house both in Hungary and in Croatia. In ROLL ME UP AND SMOKE ME WHEN I DIE, Willie Nelson riffs on everything: music, wives, Texas, politics, horses, religion, marijuana, children, the environment, poker, hogs, Nashville, karma, and more. He shares the outlaw wisdom he has acquired over eight decades, along with favorite jokes and insights from friends and others close to him. ANNOUNCEMENT: We are more than pleased to announce we represent from nowon the Furniss & Lawton agency both in Hungary and in Croatia.